Is that cute or what? 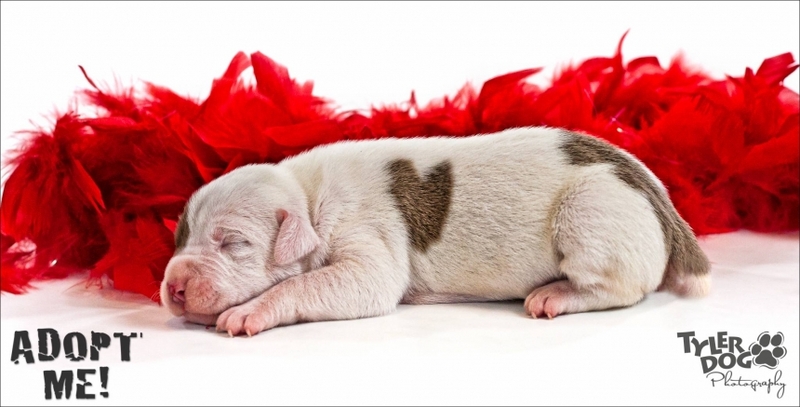 This gorgeous five-day old puppy comes with its own permanent Valentine’s heart! Friday, we photographed a litter of gorgeous Pit mix puppies, all five days old, that were rescued by Legacy of Hope Dog Rescue in Broken Arrow. These wonderful people are simply amazing and personally, I am honored to be able to help them by doing these charitable shoots. See a little bit of behind-the-scenes action during this photo shoot in a great Tulsa World article just published about TylerDog. If interested in any of the animals available with Legacy of Hope, visit their Web site or Facebook page for more up-to-date photos. Also, check back in a day or so to see all the rest of the gorgeous dogs we photographed that day! Not only did we shoot in Broken Arrow last week, but we made the trek to Sulphur, OK to help a little shelter down there. This is how social media works: Marie, a volunteer with the Sulphur Animal Shelter found me on the Web somewhere. She emailed me about helping them. I said sure. She wrote to the lady who takes care of the shelter, Amanda. Somewhere in there, a former customer, Tricia, dropped into the conversation; I had photographed her gorgeous Pit Bull, Dodger, last fall. Another volunteer, Judy, says she’ll come help. All of these people were connecting with each other and myself through social media. We planned, plotted, and got ready for a three hour drive to Sulphur for a photo shoot. Thank goodness MapQuest isn’t always right. It said I’d be on the road for four hours! 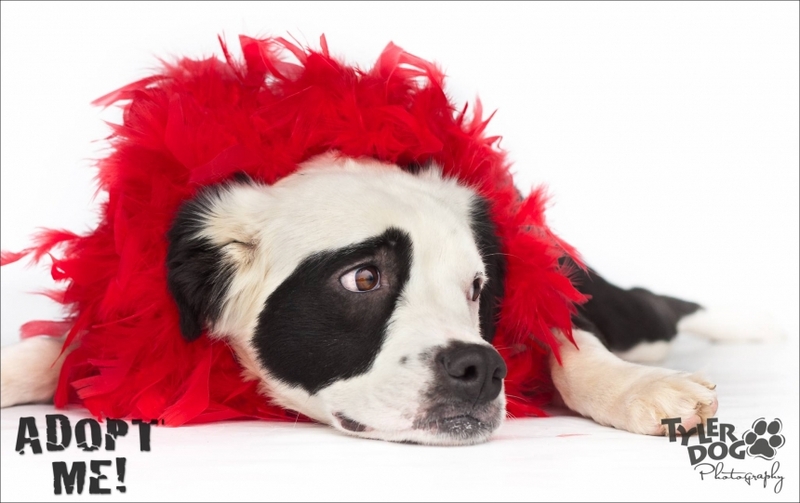 This sweetheart is Panda, a Border Collie/Pit mix. And the most awesome thing about Panda? She’s already on the way to her forever home in Texas! This is what I’m talking about: networking, photography, social media, volunteering. Bring all that together and we can make a difference, people! If you want to see more great dogs from Sulphur, visit their Facebook page. I’ll have the rest of the photos from that shoot posted shortly. I have some awesome wrist bands for TylerDog Photography that say “Saving lives, one photo at a time.” The first 10 people who comment on this post and want one, just send your mailing address to sherry @ tylerdog . com (take out all the spaces; this just stops the spammers from grabbing my email address) and let me know you want a wrist band. I’ll send one right out to you! For me, that’s what it’s all about ~ saving lives, one photo at a time! I’ve seen your photos and they’re great! I am thinking of holding some short sessions on how to photograph shelter animals if I can get the interest. You don’t have to have lights and backdrops. I’m just fortunate enough to have it. I’ve done indoors and outdoors, whatever we need to do. It can be challenging at times. 🙂 For the wristband, just drop me an email with your mailing address, sherry@tylerdog.com, and I’ll get one out to you! Thanks, Lisa! Those are awesome photos!! I have just started photographing the dogs for Chouteau Pound Pals, in hopes that I can do them justice and help to find them furever homes! My photography background has been mainly in horses and action shots of dogs. I love the studio shots that you do. At some point I will have to invest in background and lighting and learn to do that type of photography. Do you ever give clinics to teach people how to photograph shelter animals? I would be interested in attending if you do something like that.